Without a doubt the Codex Cardona is the most important source in the early colonial history of Mexico to have come to light in the present [twentieth] century. With its account of the the geography of the valley of Mexico and of contemporary Indian life, its detailed maps and street plans and its pictorial representations of topographical and historical subjects, this manuscript is a unique and incomparable source of information. It's implications for scholarship will undoubtedly be felt by students in History, Anthropology, Cartography and other fields of research for many years to come (38). But there was a problem: the paper. The Codex Cardona was written on amate, a type of locally-made paper. This breaks with tradition in that other codices that have survived have typically used more expensive European paper. Then there's the question of the date of the documents: It failed two radiocarbon tests. One date placed it at 2045 BP (+/- 50 years) and the other reported that it was modern (post-1945). Could the Codex Cardona have been forged? Who would do such a thing? A researcher? Locals looking to take advantage of the tourist trade? The text had survived 400 years before making it to a public viewing which in itself was unheard of (though not impossible). These questions and issues clearly plagued Bauer and they draw the reader quickly into the text. 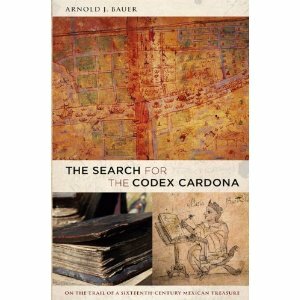 The Search for the Codex Cardona is unusual because it weaves in Bauer's musings on the history and fate of the book into his research. For example, he learns that anthropologist and historian Robert Barlow had been working in the general area where the Codex Cardona was found. Barlow possessed the knowledge and the resources to have forged the text. And his past is complicated enough (see link) that he may have been driven to it for personal reasons. With this understanding, Bauer lays the groundwork for a theory on the origin of the text. In a different typeset, he outlines the circumstances that could have driven Barlow to forgery (if indeed the work is a fake). In this way, Bauer invites the reader to imagine the book's journey with him. Bauer continues on this trail taking readers to visit assorted auction houses and their employees, and even back to Mexico where the trail warms. Ever troubled by the removal of the Codex Cardona from Mexico, Bauer presents readers with a tangible means of understanding the significance of carrying cultural artifacts across international borders. There are international laws in place to prevent the transfer of so-called patrimonial property. The Codex Cardona could represent an important aspect of Mexican history—how did it get out of the country? Bauer reveals the layers of corruption that could have permitted this lapse as he gets closer to the text. He also journeys deep into the heart of the antiquities trade, where we meet sellers who have no qualms about chopping up a find like the Codex and selling it piecemeal to increase profits. These aspects of the story shine and add a great depth to the tale which would otherwise be a summation of Bauer's research and suppositions. The initial chapters where Bauer treats the reader to an FYI on codices does get dry at some points, but the reader is soon drinking lukewarm tea with a shady seller trying to get information that the seller clearly doesn't have to offer. And Bauer does eventually find the Codex Cardona, or rather, a version of it. This could make good course reading: it's short, and direct and introduces students to the antiquities trade in a new way. It's also a good commute read for these reasons.